Up at 4am preparing lunch for my picnic lunch with the BFF for our winery tour later today. Although our package includes a cheese plate, we're going to need some food to hold down all the wine from the 5 vineyards we plan to explore. So far I'm going to have to make a Whole Foods salad bar run before we hit the road. I totally forgot to buy lentils for the salad! In addition, the rice I cooked the night before was sticky. No ma'am. I boxed the rice up and stored it in the freezer. I will use it another day to create Biryani rice. 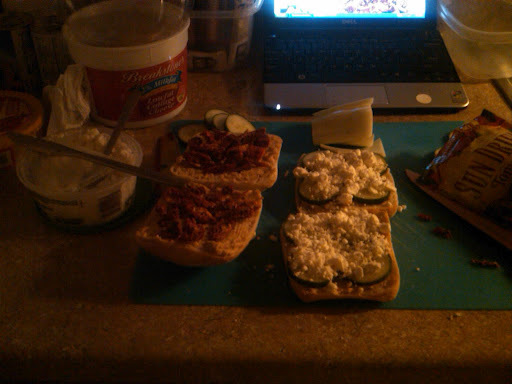 I've also decided that the sandwiches would taste better with fresh olives inside. Which both the BFF and I love. So this is when my labor of love turns into a fake 'n bake session. Looking forward to an epic Saturday! Now off to sleep for a few more hours.